Camping is a hassle. I get that. There’s no doubt that the time and effort involved stops our family from going camping more often and puts other people off camping at all. Which is a shame because camping is THE great Australian holiday experience and it creates amazing memories. There’s something about camping that gets everyone feeling relaxed, helps families bond and makes everyone sleep well at night. When you get it right it’s hard to beat camping for a family holiday experience and everything was certainly right when we experienced camped with Rainbow Beach Ultimate Camping. Here’s what we loved about our recent camping experience at Inskip Recreation Reserve near Rainbow Beach. Pots, pans and cooking utensils. Even a cheese grater and colander. A hot shower – possibly the best camping addition ever, closely contested by running water in the kitchen sink which was brilliant too. Apart from the comfy chairs, hammock, carpets and hot water shower, I also appreciated having a comfy double bed to sleep in. My husband and kids love camping but I’m not usually that keen. I always joke about how I’ll be spending my holiday squatting in the dirt and it’s pretty close to the truth. On this camping holiday I managed to avoid squatting anywhere, thanks to the generous supply of chairs and I avoided dirt because there was heaps of running water. There was even a bowl outside my tent to get the sand off my feet before entering. I’m not really a princess, I just sound like one at times, but the older I get and the more luxury hotels I stay at the more I dislike being uncomfy. Thankfully I didn’t have to endure any discomfort on this camping adventure. Either because I’m female or because I am a control freak, or due to a horrible combination of the two, I take charge of packing food and clothes when we go away. Finding bags, hats and swimmers for everyone in the family shouldn’t be too hard but something always seems to be missing. Packing the food shouldn’t be hard either but if you want to remember every single type of sauce, condiment and health addition it takes time. Then, because packing the camping equipment is tricky too, I usually have to help find, pack or lift something. But on this holiday, we didn’t even have to take bedding or towels, let alone camping equipment, so packing and getting settled in couldn’t have been easier. Inskip is also very close to Rainbow Beach which has shops, restaurants and cafes so, even if we had forgotten anything, it would have been easy to nip into town to pick it up or to eat out. As well as being comfy and easy our accommodation was also absolute waterfront with amazing views across the channel to Fraser Island. Inskip is perfectly placed for a day trip to Fraser Island, Double Island Point or even Noosa. If you have a 4WD you can drive down the beach but if you want a no-hassle experience, there are plenty of options of day trips and excursions in Rainbow Beach. We loved horse-riding on the beach and it’s brilliant for water-based activities like surfing, stand up paddleboarding or kayaking all of which you can try with a lesson or tour. So now anyone can enjoy the classic Aussie beach camping experience with no hassles. I’d rather not do it any other way. Our stay at Rainbow Beach was partly hosted by Rainbow Beach Ultimate Camping and partly paid for by our web marketing services. As always, all opinions are my own. See the Rainbow Beach Ultimate Camping website to find out more about camping at Inskip. Stay Tuned to Get In the Hot Spot! Stay tuned for more details about things to do in Rainbow Beach. I’ll be writing about that soon. Our free newsletter is a weekly injection of tips for midlife adventure to help you travel well, feel fabulous and live your dream. Tap here now for free email updates. Oh that sounds a great way to do it. Paul is allergic to camping but he could be persuaded to do this luxe version I am sure. Lol… We have many come who thought they had camping allergies until they experienced an ultimate camp. . We’d love to see you ? Now this kind of camping may just entice my husband to go camping again, it’s been awhile!! Sounds fantastic, and like you, it’s great not having to think about every angle required for a successful camping trip. Thanks for sharing. 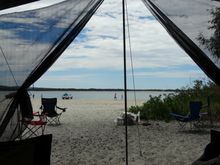 Beautiful beach camping good arrangement and all rainbow beach amazing! Previous post: 72 Hours of Running for What?